Using hite’s dry technology developed after 5years of research, Dry d is the purest and freshest beer without any unwanted taste or smell. This is beer production technology at its purest! Extra cold dry technology is used to create the purest aroma. Jointly researched with Danbrew (Denmark) for 5 years, consumer research was carried out for 2.5 years to achieve the perfect quality. The key design concept is to express Dry d’s identity more intensively. On top of a sharp steel background, the Dry d logo is engraved to visually represent its pure and fresh taste. It was a name that surprised many. Dry d was named after the direction the brand is heading. The name has a creative twist, as it can be read in both Korean and English at the same time. After 5 years of research, the best dry yeast was found after failing 49 times! The taste of beer depends on yeast, which turns barley and water into beer! To create a new taste, a new kind of yeast is essential! Yeast production technology is a top secret among beer manufacturers. After 5 years of research, we finally found special dry yeast that creates an authentic aroma by fermenting wort to the last degree. As the sweetness in the aftertaste interferes with the purity of beer, dry beer is a perfect choice for the Korean market. 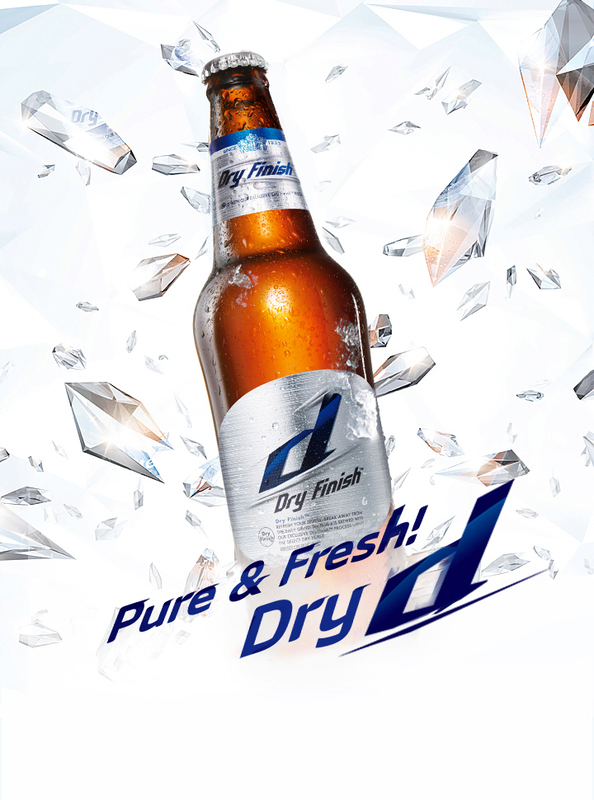 Dry d only uses premium quality yeast and ingredients to bring the best beer for Korean consumers. 1Make sure the beer is cold. 2Check for the d-Point (ask for the d glass). 4Pour the beer, aiming at the d-Point. Ergonomically designed slim body with a protruding area to prevent slippage and ensure the best grip. We listened to consumer input about the bottle’s shoulder height, making sure it represents us as a premium Korean beer brand. Although consumers prefer transparent bottles, beverage quality is ultimately more important than design. To block UV rays that affect the quality of beer, we use darker brown bottles to make sure that Dry d stands out with its premium quality. The bottle is designed with a larger bottom to minimize damage at recycling facilities and improve its recyclability. As a result, it helps save resources, and the bottles are clean with less prone to damage. The bottle design can change the perception of consumers, so we chose the bottle that can represent this drink offers the best value.